Nowadays everyone gets mad when it comes to food an drinks, it seems that we suddenly all are showing to an unknown world: “what, how much and the place where we are dining” and folks world wide are snapping, shooting, posting, creating, m writing and praying the unknown world of the followers for a “thumbs-up”… for a share, or just for some bit of fame. Food of course represents a great part of our culture and it’s one of the most popular way to engage with people and to know more about their world. However, in the past it was not exactly the same: eating was not so visible and flaunted and people were hiding the activity of having a meal or not showing it at all. It was a staple in the genre to come across the figure of the “commoner” also called the servant, who summing up, was mostly emulating the behaviours of the squire his master. While the high class was enjoying copious and rich banquets (red meat fundamentally) in the lowest estates of the Villa the reality was very different. The precariousness and the misery was now helping the development of Junk food which it just came out!! And please, it was real garbage food, accept the expression in its more literal sense! The decrepitude of that gastronomy nevertheless, was not alluding both to the preparation and to the quality. The three key ingredients were just wheat, olive and grapevine!! The literature started documenting the food and beverage operations and food and drink desires from the human point of view of the worker. It’s not a casualty if, in order to insert the food into the world of literature, the authors used the profile of the simplicity, the most hilarious and lovely person who you could ever meet inside a book: He is called Gracioso, for the theatre, or Picaro for the genre of the romance. They are both characters of the pieces. Gracioso is so comic when pays attention to the food and he is just obsessed about it, it looks like he is not scared to speak to the reader about how much he loves eating and as soon as he is able to earn some money his first idea is related to buy food. He talks without control and he complaints if the beverage is scarce But, as we well know food is a blessing and in the piece Fuente Ovejuna we find the gracioso Mengo who is offered some food by the people as a tribute for his support uprising. BARRILDO. Toma, bebe, amigo. Come. BARRILDO. Have it, drink my friend.Eat. MENGO. ¡Ay, ay! ¿Qué es? MENGO. Oh! Oh! What is it? MENGO. ¡Ay, ay! MENGO. Oh! Oh! FRONDOSO. Echa de beber FRONDOSO. Pour some drink! BARRILDO. Ya va. BARRILDO. There we go! FRONDOSO. Bien lo cuela. Bueno está. FRONDOSO. Well he strains, he is good. BARRILDO. Ésta va por mí. BARRILDO. This one goes for me. FRONDOSO. El que bien niega, bien bebe. FRONDOSO. Who is good lying, is good at drinking. BARRILDO. ¿Quieres otra? BARRILDO. Do you want another? FRONDOSO. Bebe, que bien lo mereces. FRONDOSO. Drink, you deserve it! BARRILDO. ¿Quieres más? BARRILDO. Would you like more? MENGO. Sí, otras tres vezes MENGO. Yes, three more times. Oh, oh! source: Lope de Vega, Fuente Ovejuna, vv. 2260-2273. Food toghether with comic is delivering the strategy to avoid the anxiety amongst the poverty and food is now present in the theatre, one of the first social networks. Food and Beverage was now matter to be shared, and in one of the most authentic way: bringing the commons habits into the theatre and pieces. I think that food is the most iconic way to describe the people, the era and the culture and this is the main reason why we constantly want to share it with others: in order to communicate our identity. The Picaro in the Spain of 1600 just wanted to share his identity and feelings when talking about food. 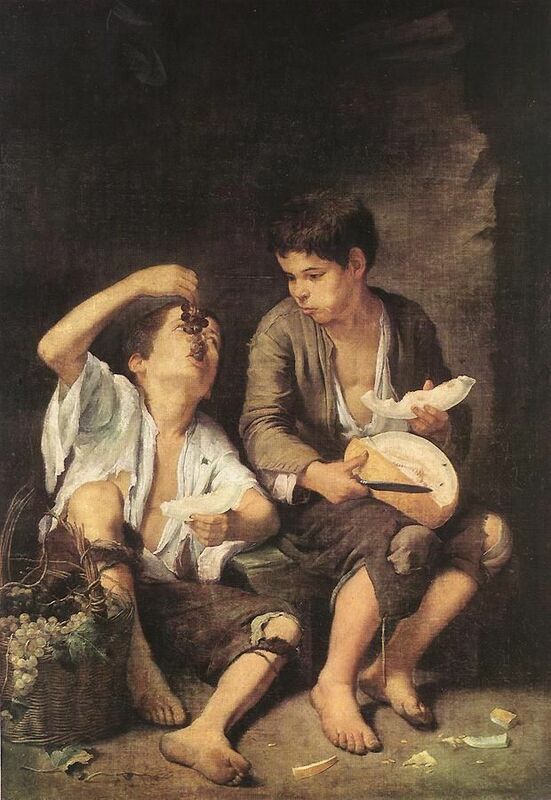 An example in the Buscón piece, Pablo is so ironic when he said that the food is denied by his master Cabra, who used to let him having some leftovers. “I asked for something to drink, as the others were fasting and they were not doing it, they gave me a glass of water, which wasn’t already came to the mouth and as it was a holy communion sink the waiter took it out upset”. Food in its most realistic elegant pose was so present in the feasts, but the masters were not bringing to the public any description of it, just the commoners were contemplating this topic. The feasts were rich but for the commoners they were scarce since they could have just the leftovers and small bites. source: La vida de Lazarillo de Tormes y de sus fortunas y adversidades, a cura di Antonio Rey Hazas, Barcelona, Castalia (Castalia didáctica), 2011, p.86. 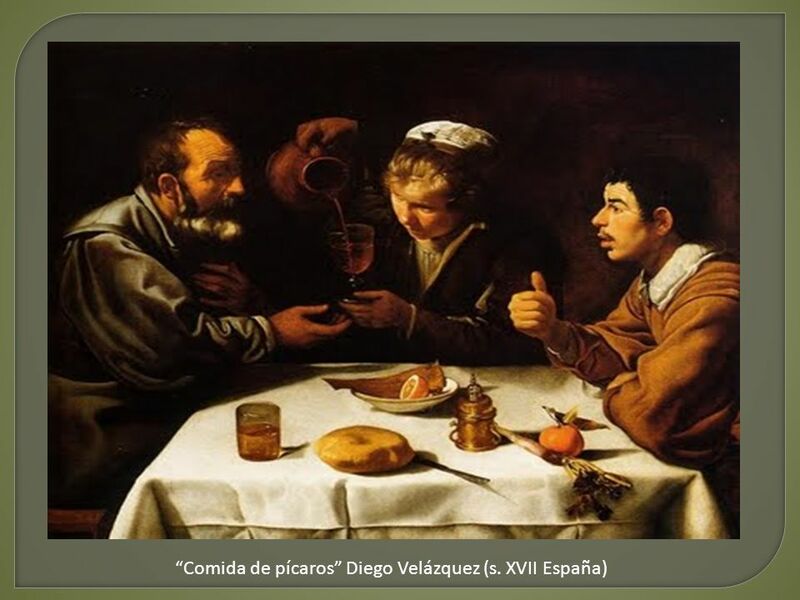 In conclusion, I believe that food and beverage belongs to the commons, to the authentics, the artists since ever, and because of this it was the figure of a simple person to deliver us some information and description about it. ← Turkish tea time at the Istanbul Gran Bazar! !